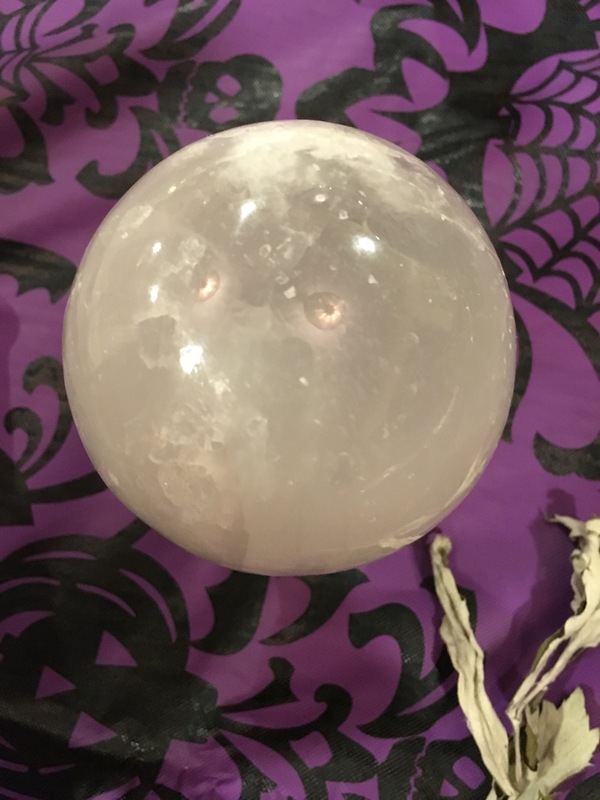 Our December WWW met on the first Wednesday of December to discuss warding and protection magick and to create some simple warding witch balls. 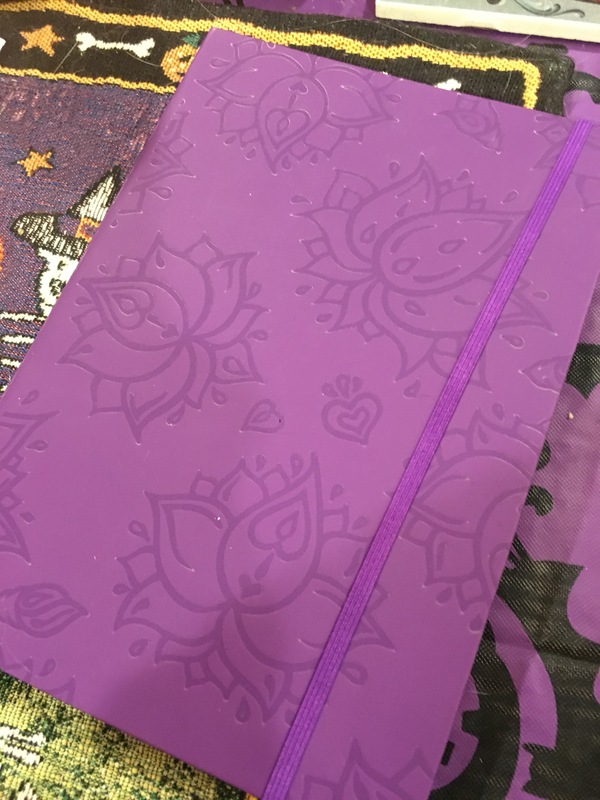 We had decided that daily magickal protection was important to all those who work on a metaphysical plane especially, and should be part of any Witchy 101 training. 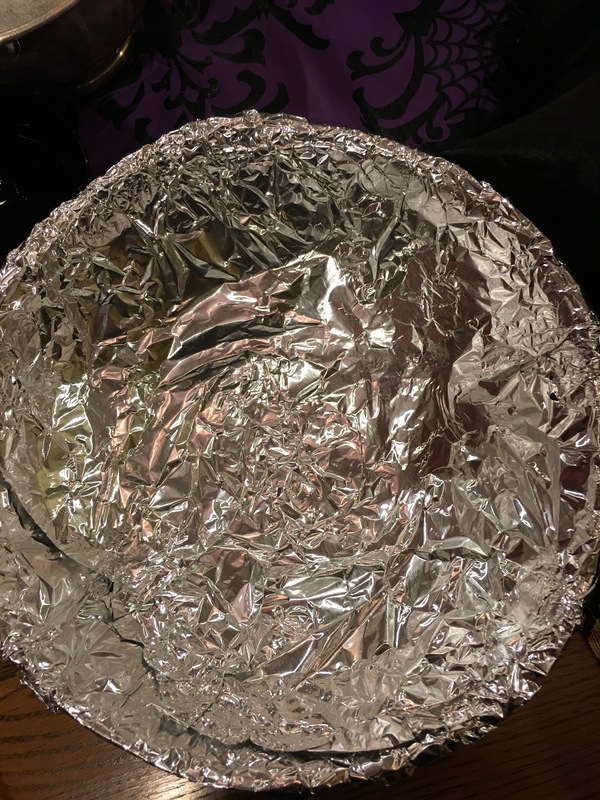 We started out by asking how each of us was already using some sort of protection magick. Many mentioned the use of an envisioned white light as a shield around themselves either upon arising in the morning, during spell work and divination, or before retiring at night. Some used herbs as smudge and a few used crystals around the home. I release you now, be on your way! From here on out I banish thee. 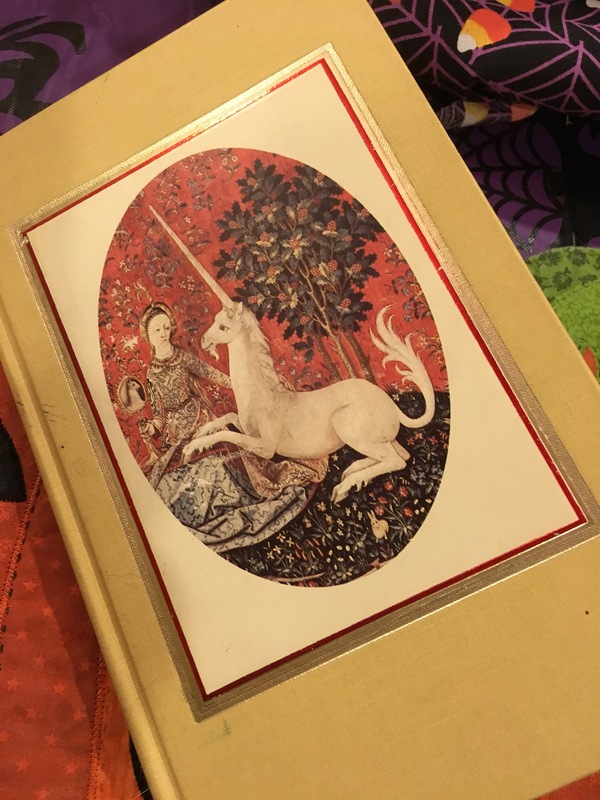 We talked about wards, which are a type of guard in the form of symbols or enchanted objects that can be placed around the home as protective devices. We also pointed out that one can use a mental ward in the same way by, say, visualizing a pentagram or other protective symbol or object/being. We all agreed that staying positive and maintaining the highest possible personal energy was probably the most protective act that a witch could perform. Our activity of the evening was to make witch balls to hang around the home. Mine is hanging in the window now. 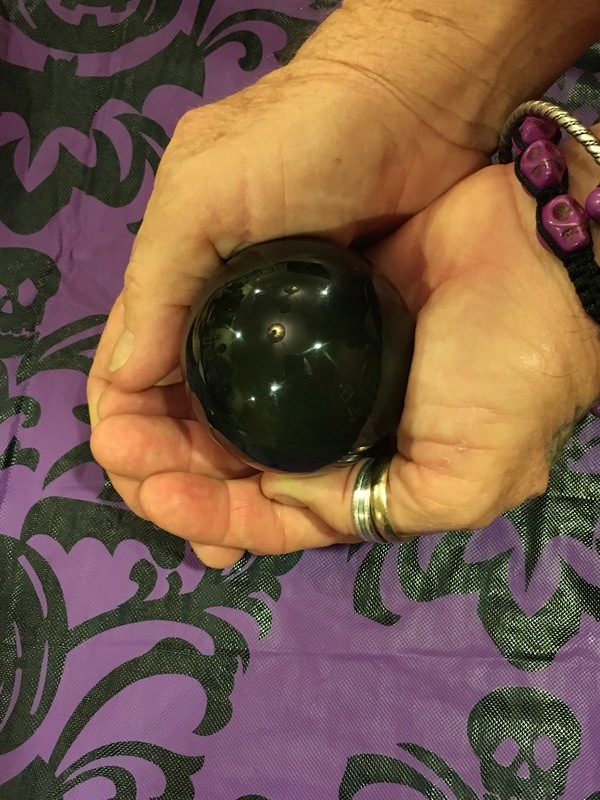 You could make a witch ball with any combination of protective elements you choose. We used those that we felt went with the Yule season. To complete our wondrously witchy balls, we replaced the ornament caps, added a safety pin hanger and decorated the tops with more ivy and ribbon. 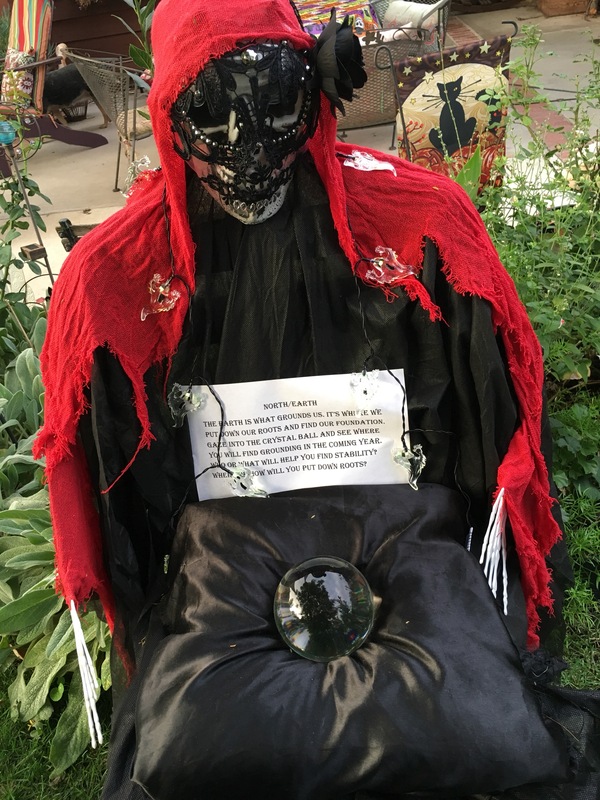 We took them outside where we toasted to and broke bread with the Lord and Lady, and charged our witch balls to do their protective work. 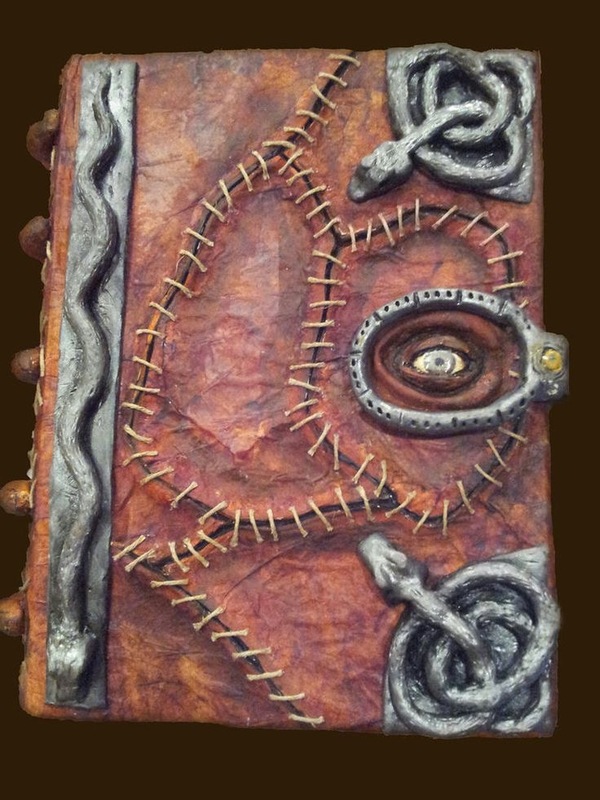 I’d love to hear about any magickal wards you have used around your Magickal Cottage so feel free to share! Last evening our coven got together for a Samhain dumb supper and ritual. Since the veil between the physical and astral planes is very thin right now, it is an excellent time for spirit contact and divination. 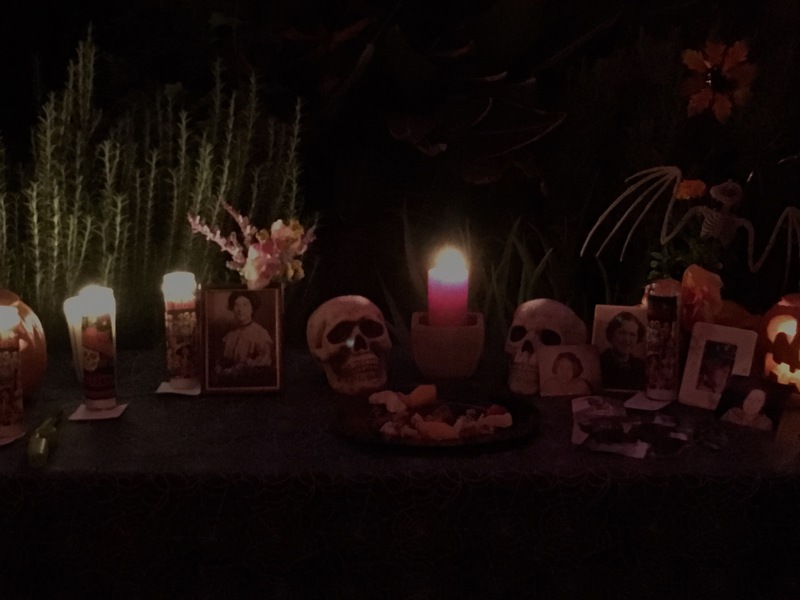 We set up our ancestor altar, filled our plates as well as an offering plate for the ancestors, listened to a short invocation and began to eat in silence. After we finished our supper and began speaking again, all present seemed to agree that the entire circle area was filled with spirit. 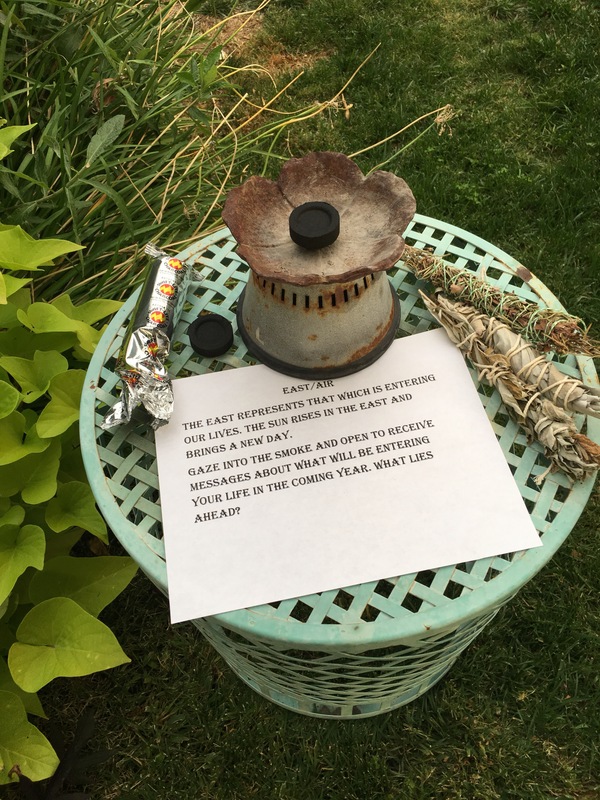 Some got messages from loved ones, and we shared stories about those we were honoring on our altar. This was an emotional time as we felt our loved ones in spirit draw near. 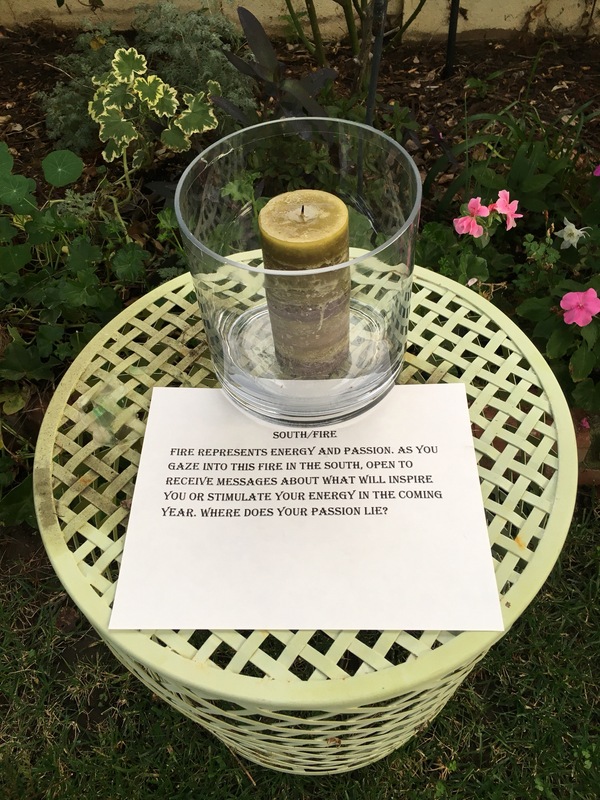 We moved to the grass area of the circle where our ritual altar was set up, called the quarters and then started the evening divination for the coming year using each of the five elements. 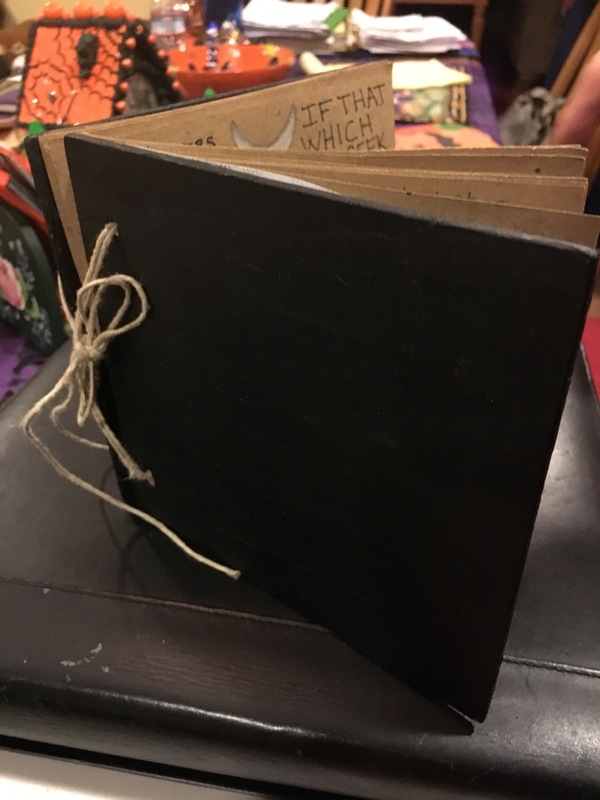 Since Samhain is considered to be the Witches’ New Year, we were asking for messages about the year ahead. For the east/air we used smoke to scry for messages about what new energies may be entering our lives this year. 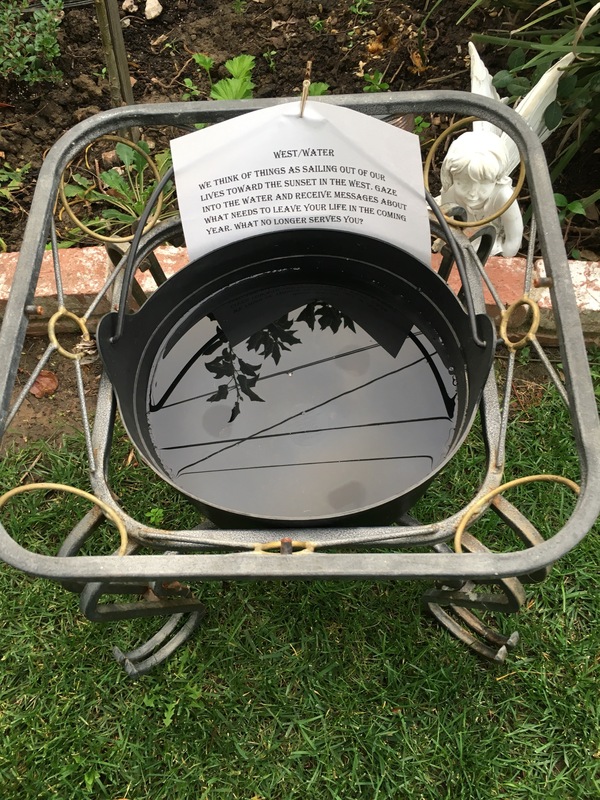 This smokey scrying tool was set up near our east quarter. 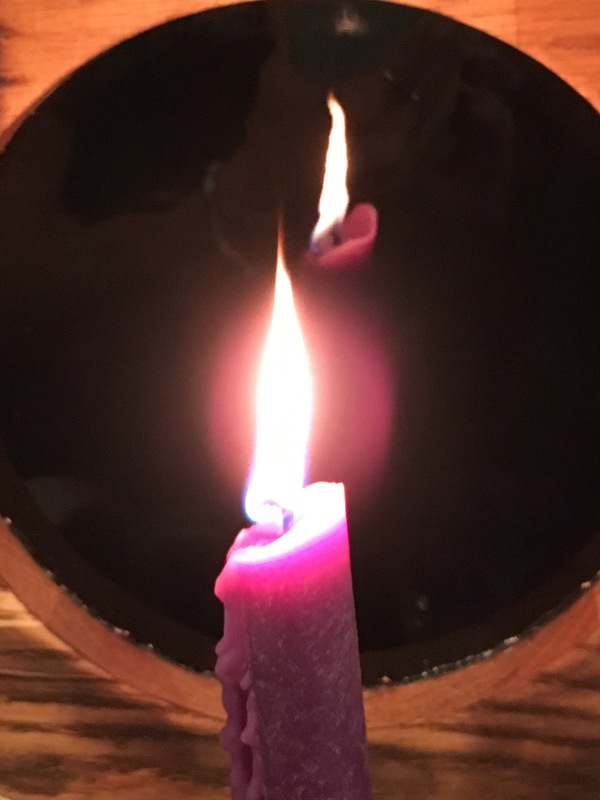 In our fiery southern quarter a candle flame was used to scry for messages about where our passions will lie in the year ahead. In the watery western quarter a cauldron of water was a scrying tool to find out about what would be leaving our lives in the coming year. 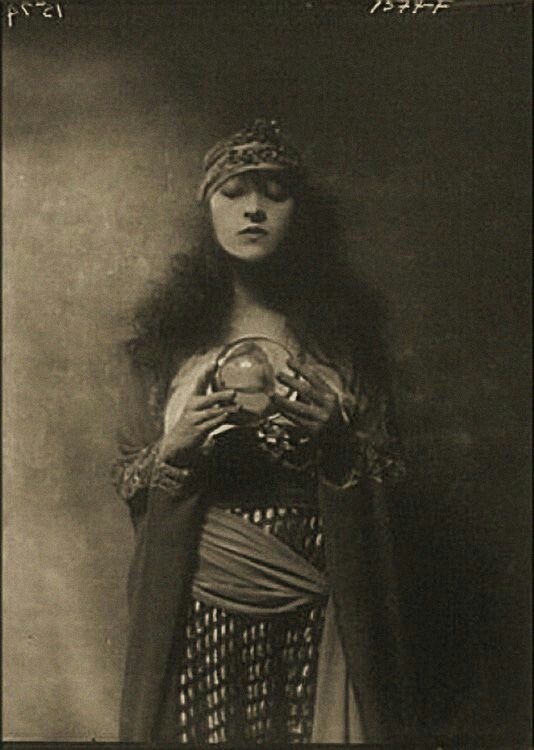 In the earthy northern quarter a crystal ball was placed to gaze into for a sense of where we would find our grounding and stability this year. 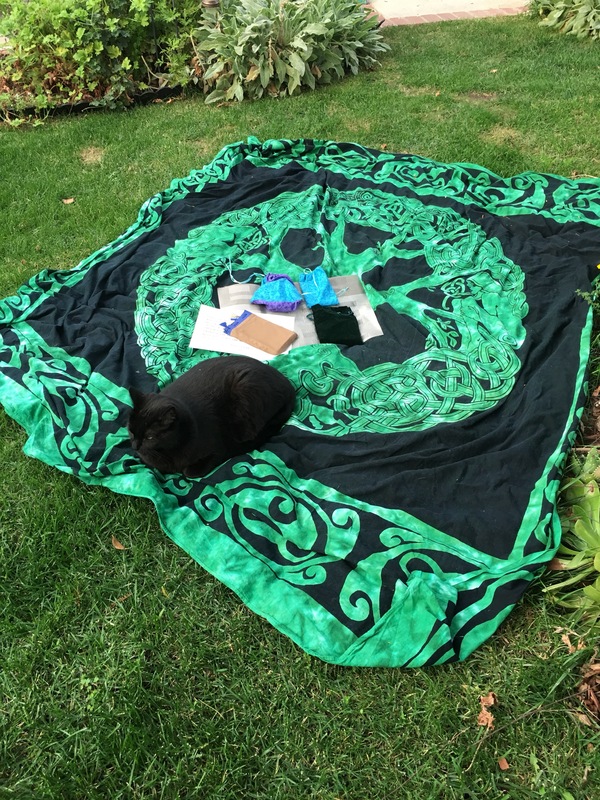 And, finally, in the center, a blanket was placed with tarot and oracle cards to contact the Lord and Lady in the ether for any special insights or areas to focus on in the year to come. After our ritual was closed we went indoors and shared all the many insights we had gained through our divination. The growing season is coming to a close for many of us and it is time to turn inward. With all the parties and revelry associated with Halloween, it was nice to set aside this time to grow quiet and listen. 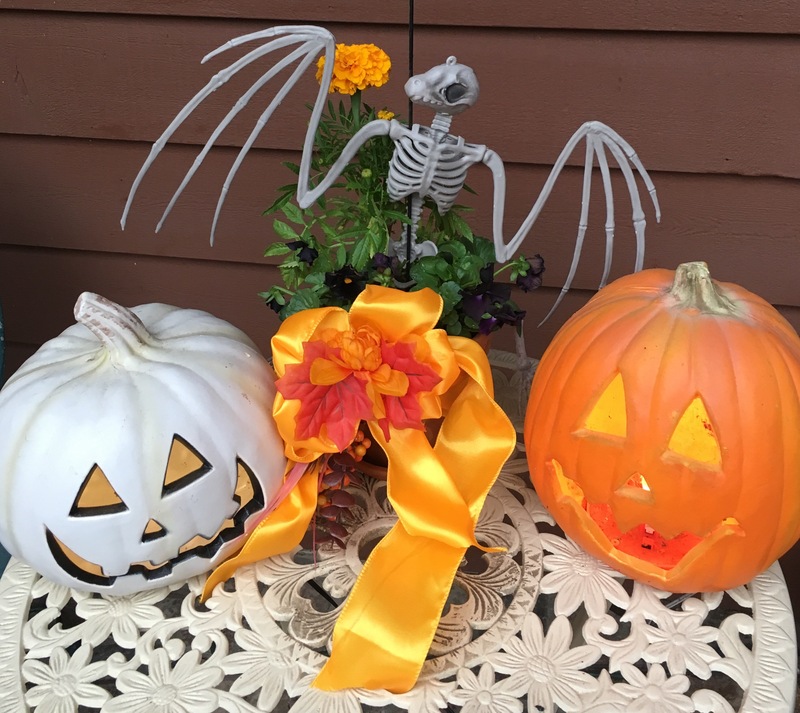 May you receive helpful and bounteous messages from beyond the veil this Samhain to encourage you along your path. 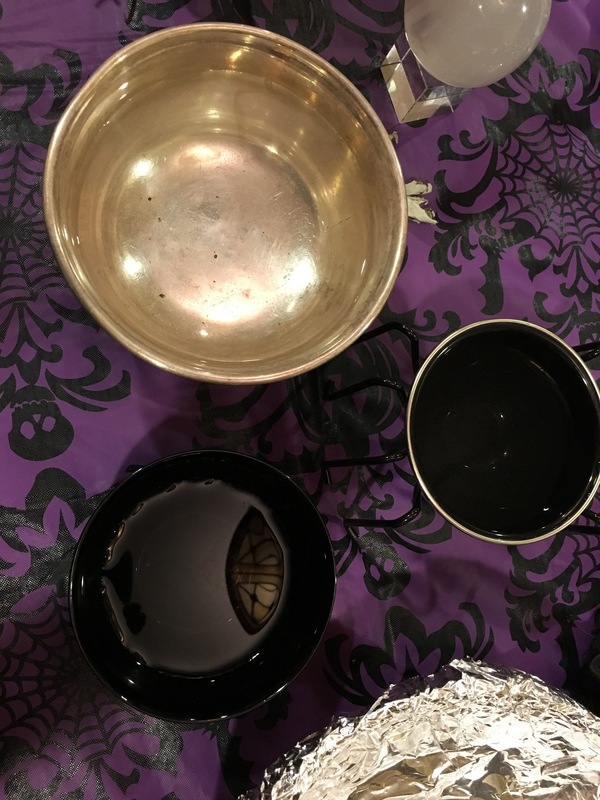 Four of us gathered for our WWW workshop on the use of a pendulum and the tools and methods of scrying. The evening, as expected, turned out to be quite magickal indeed! We started by creating sacred space and calling in positive energies of protection and guidance before starting our discussion and practice. Creating a sacred space is always a good idea when dealing with energies from other realms and planes of existence. Not only do we want to create a safe space but also to call for guidance in what we are about to undertake. We invited all helpful energies in and told all other energies to leave our space. We began by stating that each person has their own way of receiving psychic information. We reminded each other that there are psychic senses called “the clairs”. Clairvoyant (clear vision) — To reach into another vibrational frequency and visually perceive “within the mind’s eye” something existing in that realm. A clairvoyant is one who receives extrasensory impressions, and symbols in the form of “inner sight” or mental images which are perceived without the aid of the physical eyes and beyond the limitations of ordinary time and space. These impressions are more easily perceived in an alpha state and during meditation, though many clairvoyants can obtain visual information regarding the past, present and future in a variety of environments. Clairaudience (clear audio /hearing) — To perceive sounds or words and extrasensory noise, from sources broadcast from spiritual or ethereal realm, in the form of “inner ear” or mental tone which are perceived without the aid of the physical ear and beyond the limitations of ordinary time and space. These tones and vibrations are more easily perceived in an alpha state and during meditation, though many clairaudients can obtain verbal and sound-related information regarding the past, present and future in a variety of environments. Most Channelers (also known as Mediums) work with both clairvoyance and clairaudience. future in a variety of environments. Most Channelers (also known as Mediums) work with both clairvoyance and clairaudience. CLAIRSENTIENCEpreviously known by the clairtangent. Channeling — To allow an etheric world intelligence to enter one’s mind and impress thoughts upon the consciousness to be spoken aloud, using one’s voice or body to deliver the information or healing energy. It’s important to not compare your abilities at receiving psychic information to others because we are all different and receive this information in our own unique ways. 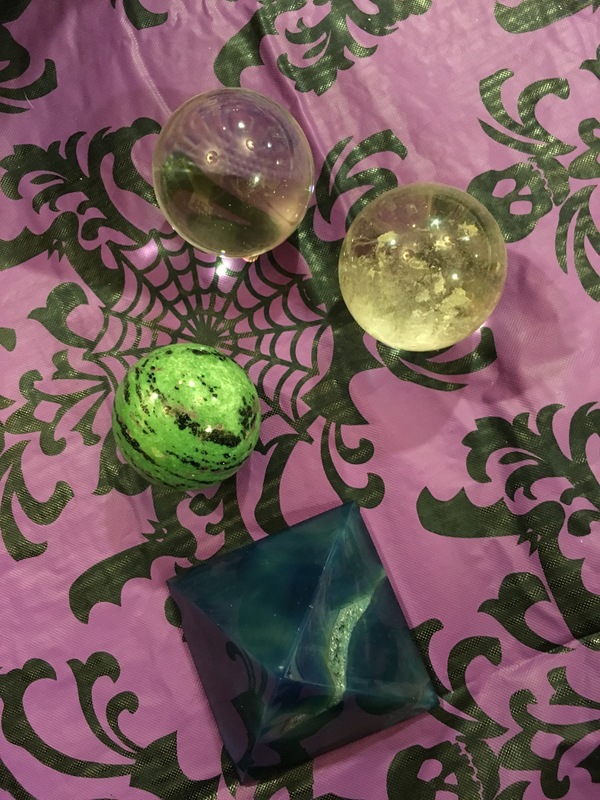 We took a survey of who had experience with using a pendulum or various scrying tools and found mixed levels of experience in our group. All four of us did own a pendulum and a discussion and practice of pendulum work seemed like a good place to start. We did a brief meditation, breathing deeply as we inhaled and slowly exhaled all the tensions of the day. We relaxed our bodies and sent etheric roots through the souls of our feet into the earth to ground ourselves. 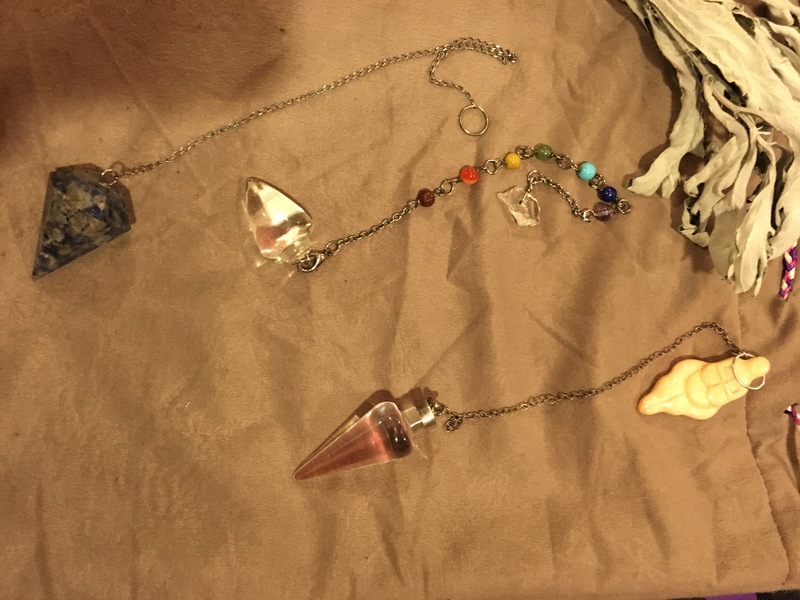 Pendulums can be useful for getting a read on whether to cast a certain spell or to varify other information you have received. 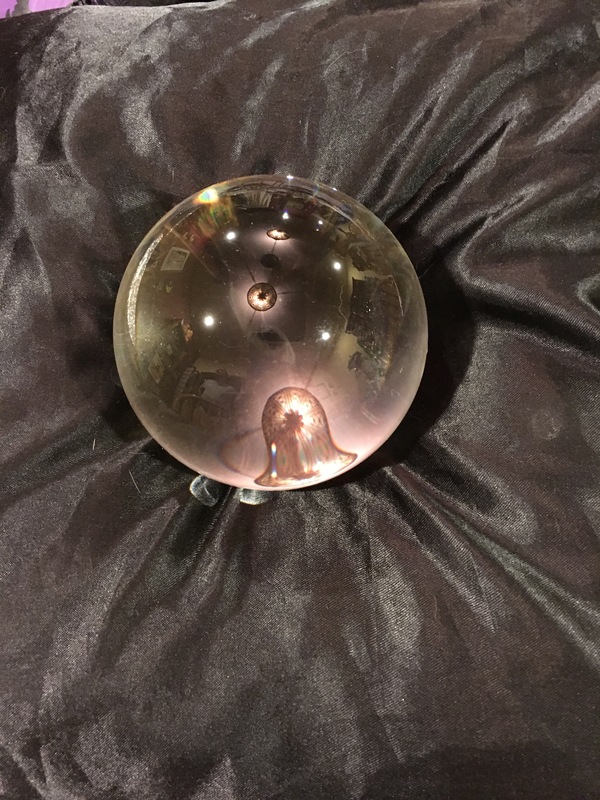 There are certainly many ways to use a pendulum, but we decided to just cover using one to get a “yes” or “no” answer for this particular workshop, and to revisit the topic at some future date for more pendulum practices. It is best to attune your pendulum to your own energy. The best way to do that is to cleanse, annoint and practice with it. Incidentally, that goes for all scrying tools as well. To energetically cleanse an object it can be exposed to the five elements of earth, air, fire, water and ether in any combination. Smudging, rinsing in purified water, burying in earth or salt for a time and giving the object energy can be great ways to cleanse it. 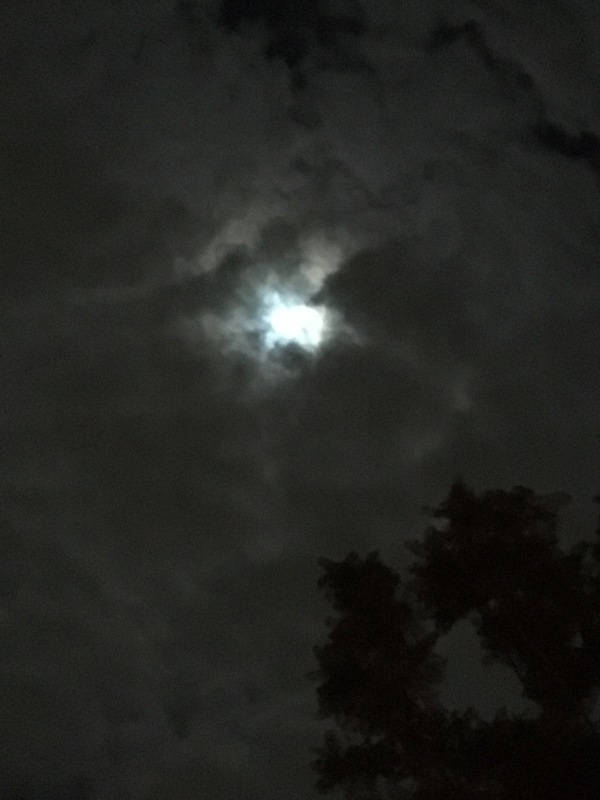 Annointing or blessing a tool can be accomplished by exposing it to the full moon, applying blessing oil or, an old time witchy favorite, bathing it in a tea made from mugwort. After the cleansing and annointing comes the practicing. Using your pendulum takes some exploration. You are basically getting messages from your subconscious mind and your “yes” and “no” answers from the pendulum will be unique to you. Start by holding your pendulum so that it dangles from the end of the chain or cord between your fingers. Many people prefer to hold the chain between the thumb and index finger, but find what is comfortable and what works best for you. Also figure out which hand works best for you. Some people say dominant and others that the non dominant hand works best. Your goal is to find out what gives you the best results. I write with my right hand but do other things (like high jumping in high school) on my left side. The pendulum works best for me when I hold it in my right hand. Experiment! The way to determine the “yes” answer is to ask your pendulum out loud something that has “yes” as the obvious answer. If your name is Jane, hold the pendulum, look away and state aloud, “Is my name Jane?”. Pause for a moment and then look at the pendulum and see how it is moving: clockwise, counterclockwise, back and forth, side to side. It may take a few tries but you should get an answer. Relax! Next, do the same for your “no” answer, noticing the pendulum’s response. If your name is Jane try asking if your name is David. You get the idea. Don’t give up! 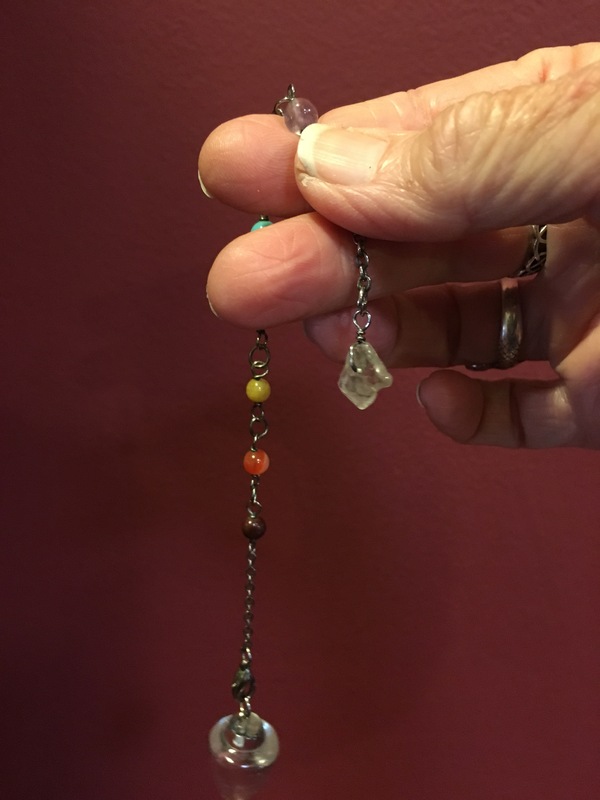 Pendulums can be very useful tools to an energy worker. I found I had to be standing with my left hand on my hip to get mine to work, so be creative. We practiced with the pendulums and the newbies promised to continue practicing at home. 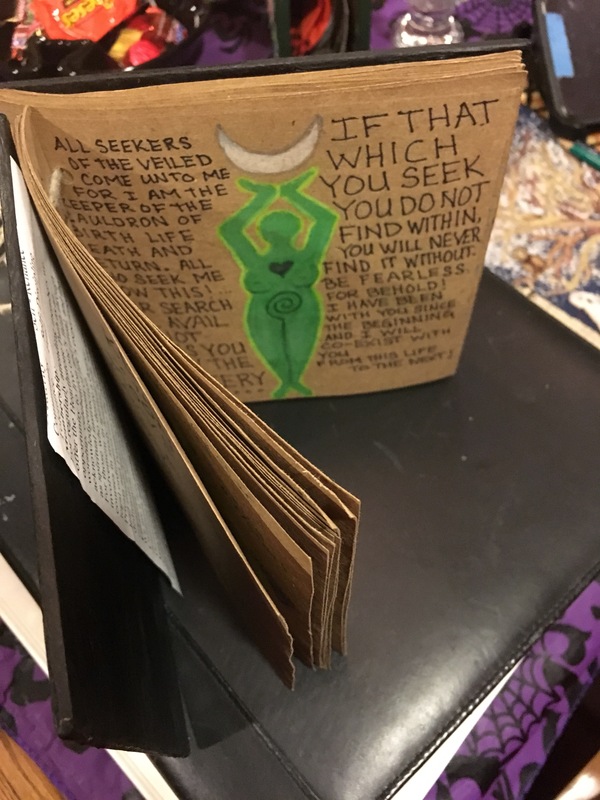 At this point we pointed out that all magickal tools should be kept in their own sacred place such as a bag or a box placed on an altar or other protected spot. 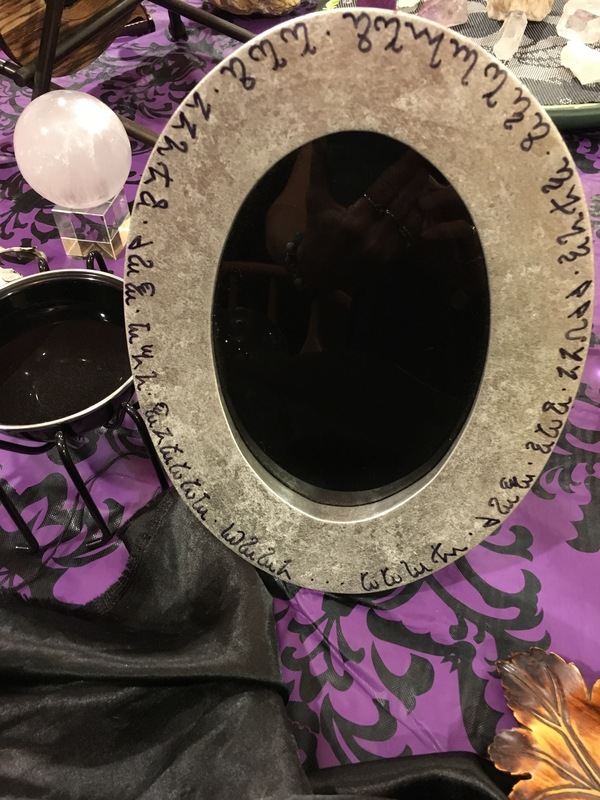 Two magick (black) mirrors. Only one was photographed. And a candle flame. We took turns rotating around the table and practicing with different tools. 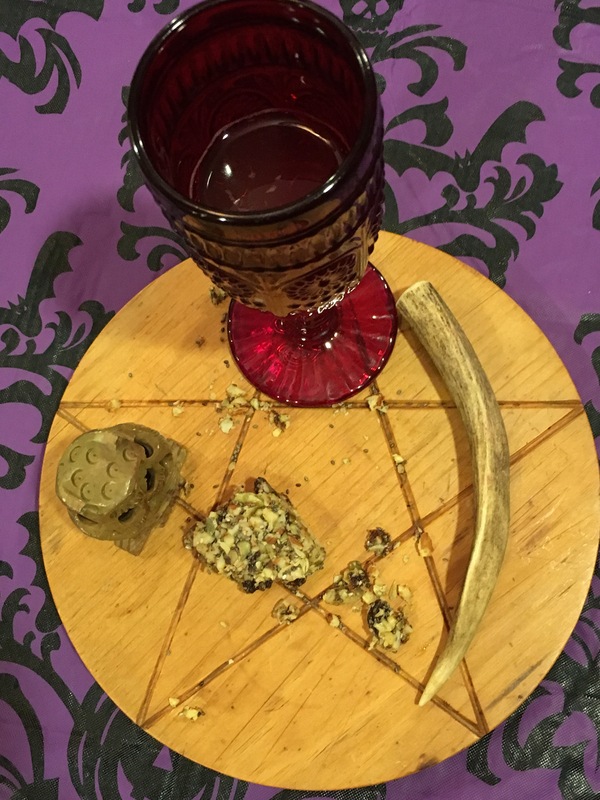 I won’t go into all the things we saw and messages we received from these magickal tools, but the evening turned out to be pretty mystical, and our Witchen Witchy Wednesdays seemed to be off to a great start! We moved our group outdoors to witness the Harvest Moon and give thanks to the Lord and Lady and all who had assisted us. 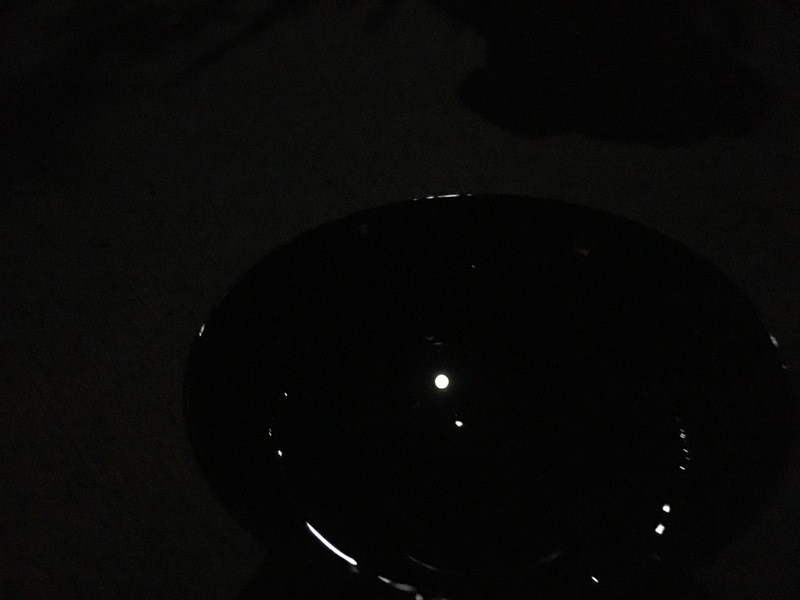 We even managed to catch an image of the full moon in the water of one of our scrying bowls. Just wanted to share this lovely article!